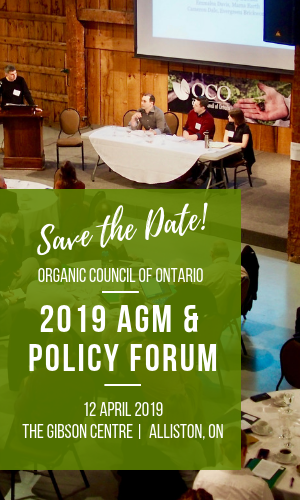 Organic Council of Ontario has worked closely with our colleagues at Foodland Ontario to bring you Foodland Ontario Organic. The new branding opportunity supports Ontario producers, processors, and retailers to connect eaters with local organic foods. To sport the logo, products must meet the Foodland Ontario Standards and be certified to the Canada Organic Standard. Consumers care about both where and how food is produced. In a recent OMAFRA study, 24% of respondents claimed they would purchase more organic if they knew it was from Ontario. Foodland Ontario Organic addresses this by pointing consumers toward local and organic foods. To learn more about the Foodland Ontario Organic Program, please contact our office.